Building the Blog Part 1: Why a Blog? Why would I put together a new blogging site, put it out on the Internet under my own name, and make plans to start posting content to it? Well, I’m glad you asked. Not too long ago, I decided that it would make sense to build a professional presence on the Internet. I wanted more than just a typical LinkedIn profile, though. I wanted a place where I was completely in control of the content and the presentation. A place where I could discuss the latest technology I’m working with. A place where I could share what I’ve learned, and what I hope to learn. I don’t necessarily mean to try and achieve semi celebrity status like Scott Guthrie or Joel Spolsky, rather to be able to illustrate that over time, you’ve been actively involved in the areas in which you profess to have expertise. It’s one thing to present a CV or a LinkedIn profile which says you’ve done everything from writing enterprise software to creating perpetual motion, it’s quite another to be able to reliably substantiate it. “It’s quite another to be able to reliably substantiate it.” That’s sort of the crux of the matter, isn’t it? How does one prove that they know what they say they know; that they’ve done what they say they’ve done? Honestly, one doesn’t. We’re not exactly writing mathematical theorems here, but proof is still hard to come by. Yet, if one spends enough time talking about a subject, they just might convince others that yes, they do in fact have a clue. Putting aside the professional reasoning behind this blog for a second, my hope is that some of the things I’ve learned will help others, as well. I’m often overjoyed when I figure out how to fix some small, nagging, seemingly unsolvable issue. That got me thinking…maybe some of this stuff I’ve discovered would help my fellow Internet wanderers. It certainly couldn’t hurt, right? Okay…maybe it could… Note that no guarantees are offered or implied. Building the blog is half the fun! There are many ways in which one could achieve the professional goals I mentioned above. Blow up on Twitter, get heavily involved in professional conferences/networking, become a world-class self-marketer, etc. Starting with a blog served two purposes for me. Not only would it help meet my professional goals, but it would also help me to expand upon my own knowledge. I believe it’s important that any professional, but most especially an IT professional, continually expand and refresh their knowledge. IT is an extremely fast-moving field. Ignore the latest and greatest, and you’ll soon get left behind. In creating this website, my hope has been to learn more about the greater blogging ecosystem. Blogging systems, SEO, website design, etc. I have already been quite successful in that regard. Not content to setup a cookie-cutter blog, I’ve tweaked and re-worked this site multiple times. I first developed an entire Blogger-based site, from scratch. Then, based upon a number of factors I’ll discuss in a later post, I shifted to a WordPress-based site. Having already spent considerable time on the Blogger site, I chose to forgo building the WordPress site from scratch. Instead, I started from a pre-made template. I then tweaked nearly every aspect of said template, conforming it to my needs. 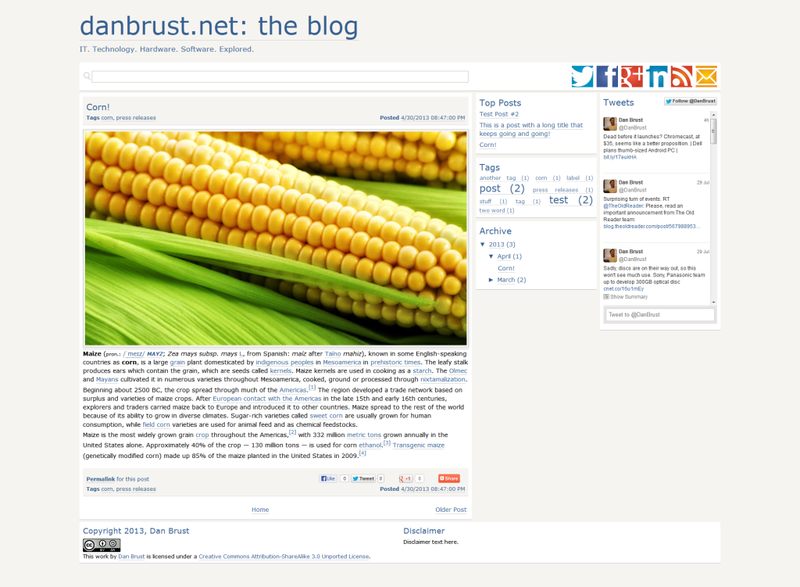 Here’s a look at the Blogger site I developed before moving to WordPress. I do not regret the time I spent developing the Blogger-based site. I learned much about that platform, and would feel right at home working with such a site in the future. Much of the knowledge I gained on that site was put to use here on WordPress. I really liked a lot of the design aspects I had come up with for the Blogger site, so I worked to emulate that look here on WordPress. Blogger and WordPress each have their own design styles, limiting the elements I could move over to WordPress, but I was able to come to a happy medium. In my work on the WordPress site, I’ve found the WordPress system to be extremely flexible and easy to work with. It’s easy to see why WordPress is used for so many different types of sites. You’ll find the core WordPress system running blogs, e-commerce sites, static websites, everything under the sun, really. This entry was posted in blog and tagged blog, Blogger, WordPress by Dan Brust. Bookmark the permalink.